We can partner with you to deliver clinical audits and patient reviews at a primary care level, as part of a Medical Education Goods and Services agreement (MEGS) or Joint Working Agreement. This allows Healthcare Organisations to adhere to their treatment pathways vs. guidelines, and implement best practice to improve patient outcomes. We have the contacts and experience necessary to introduce your expertise to the NHS and then manage the audit and implementation process. We identify priority patients for review and highlight potential gaps in clinical management. Our action planning template informs and supports clinicians to take action. Our reporting allows the Healthcare Organisation to measure progress vs.key performance indicators and track implementation vs. the objectives. By helping Healthcare Organisations to help their patients in this way, you benefit from increased brand usage of appropriate medicines and devices and an enhanced reputation. In turn, this gives you better access to key NHS decision makers and influencers. We are able, where required to offer a tailored clinical resource to support the review of patients. This support is available on request. Enhance HF was also successfully implemented across Bradford Districts CCG, as shown in the video below. 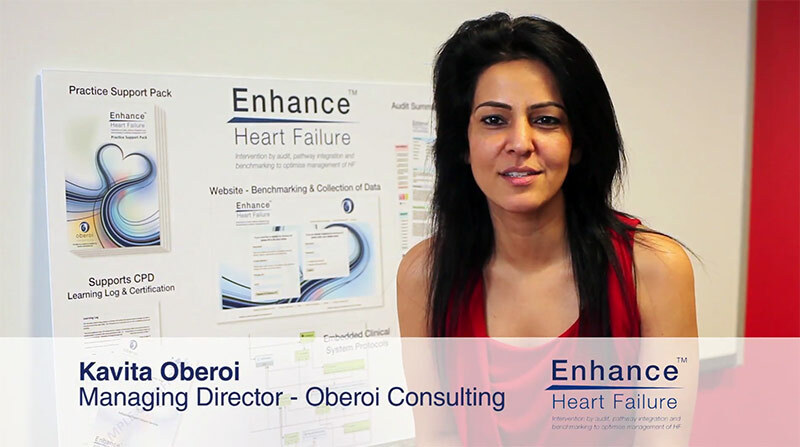 Kavita Oberoi OBE & Dr Matthew Fay discuss the "Enhance HF: Optimisation of Medicine in Heart Failure" for Servier. Through a Joint Working Agreement involving three pharmaceutical companies - GlaxoSmithKline UK, ProStrakan Ltd and Shire Pharmaceutical - we launched an audit and review process at a primary care level. An interview with Shirley Smith, Assistant Director of Joint Commissioning to the NHS Nottingham City Council Clinical Commissioning Group, in which Shirley discusses her experience of working with Oberoi Consulting on this project.